Indigestion is a catch all term describing a number of minor discomforts. Acid indigestion, also called sour stomach or upset stomach, is a term used to describe abdominal discomfort often associated with food intake. 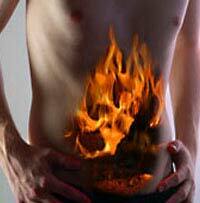 Heartburn is an acid indigestion symptom that often accompanies an upset stomach. Heartburn is a sensation of warmth or burning located in the chest. The burning & pressure of heartburn can last as long as two hours and is often provoked by bending over, lying down or eating certain foods, such as citrus fruit juices or spicy sauces. Heartburn does not involve the heart. Heartburn can cause a burning sensation under the breastbone and mimic the pain of angina, but it has nothing to do with the heart. However, distinguishing between heartburn and heart disease can be difficult. If chest pain persists or is accompanied by other symptoms (such as light-headedness, sweating and rapid pulse), you should call for help immediately. Occasional acid indigestion symptoms are common in most people. If you occasionally suffer from symptoms of acid indigestion, an antacid may relieve the discomfort and pain. If your symptoms are more frequent or severe, see your doctor.